AMD has today extended its latest Zen CPU and Vega GPU architectures to the value segment of the market by announcing the AMD Athlon 200GE, 220GE and 240GE chips that are hewn on a 14nm process and use the popular AM4 socket. The last straight-up, non-X Athlon processors were manufactured in 2001 so today's imagining with the firm's cutting-edge technology makes sense and, if you are old enough, induces pangs of nostalgia. The base Athlon 200GE's specifications are just what you would expect from an entry-level processor. A dual-core, quad-threaded Zen chip operating at 3.2GHz ought to be more than good enough for basic PCs, with AMD promising Intel Pentium G4560-beating performance in practically every CPU benchmark. Likewise, though Vega never really caught on in discrete form, a three-CU graphics part has enough chops to play popular games with relative ease. Delving into the footnotes of a press release and underscoring this point by comparing performance against that price-equivalent Intel Pentium G4560, AMD reckons the new Athlon 200GE is 12 per cent faster - 65fps vs. 58fps - in Dota 2 (720p, low), 58 per cent faster - 71fps vs. 45fps - in CS:GO (720p, ultra), 75 per cent faster - 49fps vs. 28fps - in Fortnite (720p, low) and 66 per cent faster - 111fps vs. 67 fps - in League of Legends (720p, ultra). Healthy graphics leads all round. In related news, AMD also announced a number of new commercial processors that fall under the Pro banner. In particular, the Ryzen 7 Pro 2700X is said to offer a 10 per cent performance uptick over the first-gen model. “We are proud to expand our successful “Zen” core-based consumer and commercial product portfolios today with the addition of AMD Athlon, AMD Athlon PRO, and 2nd Gen AMD Ryzen PRO desktop processors. 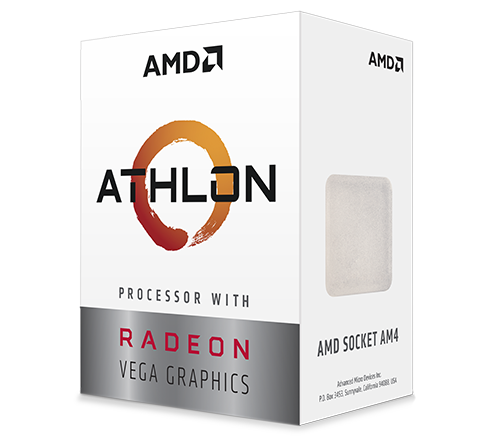 The new Athlon desktop processors, now incorporating the advanced “Zen” 3-core and “Vega” 3 graphics architectures, energize a legendary processor brand in AMD Athlon – a brand that consumers and PC enthusiasts alike trusted throughout nearly two decades of innovation,” said Saeid Moshkelani, senior vice president and general manager, Client Compute, AMD. The Athlon 200GE will be available on the 18th September, while the Athlon 220GE and 240GE will be available in Q4. could be good for bargain builds and htpc's. I assume like the other APUs the ECC ram doesn't work? Still, nice that they included some integrated graphics unlike the FM2 athlons. Good value APUs. Wonder what the 220GE and 240GE will add - probably a bit of clock speed and maybe a bit more GPU ($99 Ryzen 2200 is 4C4T and 8CU, so makes sense to scale up to that a bit). They will be stop gap before zen 2. Much like AM3 before Bulldozer. Perfect for SFF or budget.